Is your garden overflowing with zucchini yet?! We are a little behind the curve where we live, but I remember this time of year when we lived in a more moderate climate and we were starting to wonder what to do with our zucchini, who we could give some to, etc. 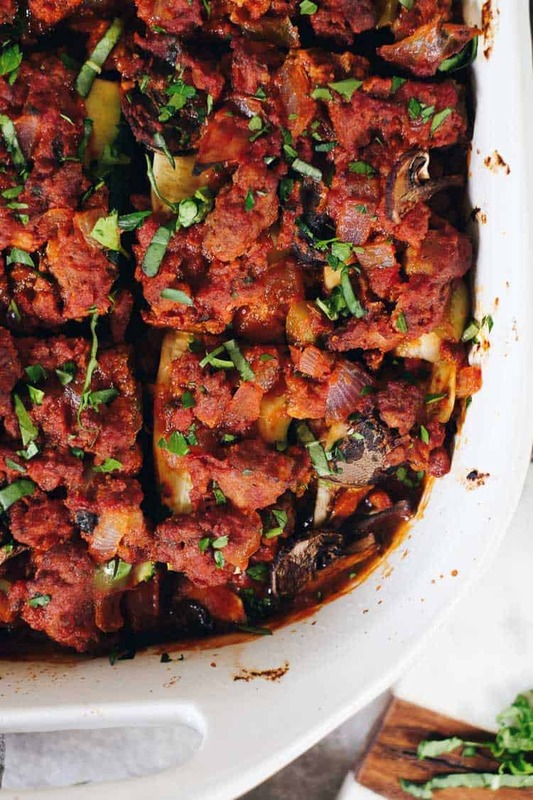 Well, this Paleo zucchini lasagna is a delicious way to use up your zucchini! 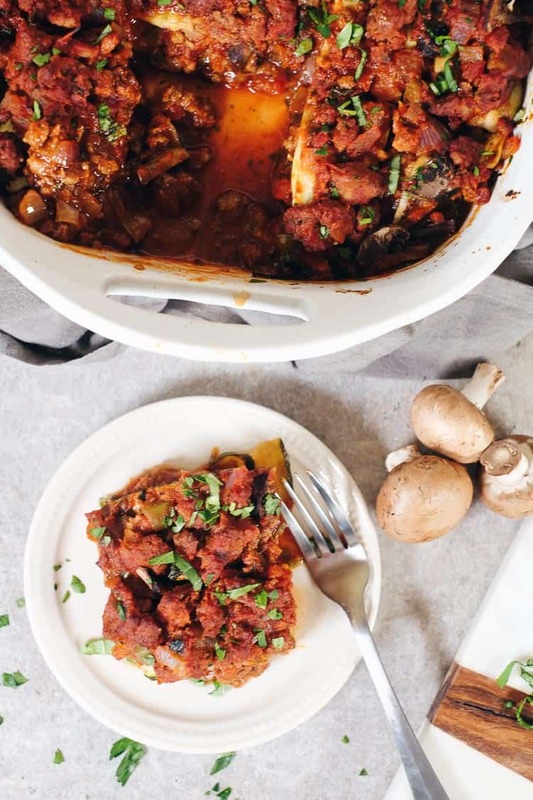 Plus, you won’t suffer the bloat and upset stomach you might get with a traditional lasagna. I don’t know about you, but I sure used to love all the pasta dishes, especially when they involved lots of cheese. However, I distinctly remember feeling great as I began eating these meals, but pretty terrible shortly after they were over. So for me, the short-lived joy just isn’t worth it anymore. That doesn’t mean you have to sacrifice flavor though! I thought I’d have a terrible time giving up cheese, but honestly I don’t miss it that much. Every once in a while we do indulge in grass-fed cheese. 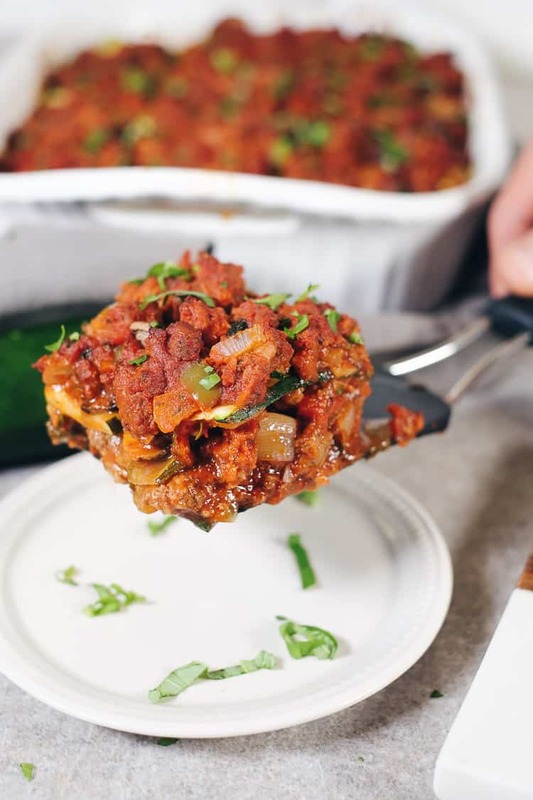 That is good enough for me, especially when we create recipes like this Paleo zucchini lasagna that are super flavorful and I don’t even miss the dairy! We’ve found it works best if you cut the ends off, and then slice a small strip off lengthwise to create a flat surface. Lay your zucchini with the flat surface down, and slice thin strips lengthwise to create sheets of zucchini. We try to slice as thin as we reasonable can and then call it good from there. Some pieces don’t turn out as pretty as others, but rest assured. It all comes together just fine in the casserole dish! 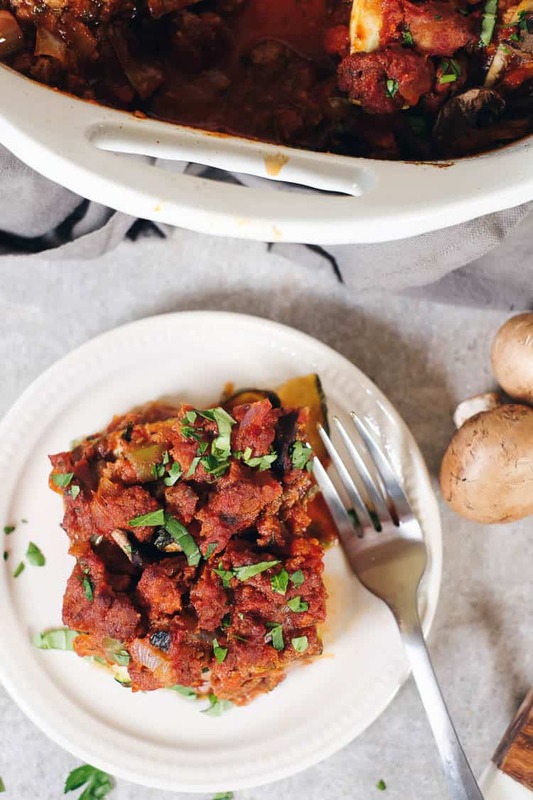 You’ll be so glad you made this big casserole dish! The leftovers might just be the best part! It makes for an easy meal another night or is great for packing for lunches. You could even fry up an egg to put on top for breakfast. Just sayin’. 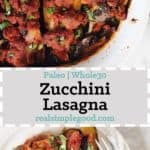 Gather your zucchini from the garden or go pick some up at the store, and make this Paleo zucchini lasagna! 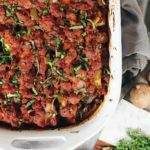 It’s super flavorful and packed with healthy veggies! Let us know how it goes by leaving a comment below. Also, take a photo and tag us in Instagram @realsimplegood, so we can check it out! 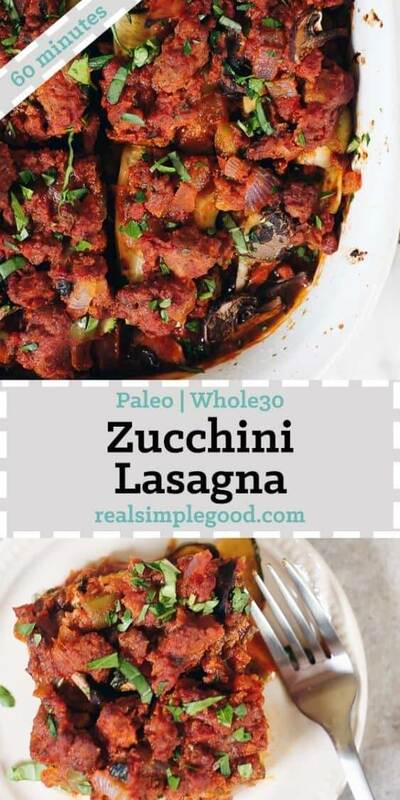 This Whole30 compliant Paleo zucchini lasagna is a delicious way to use up zucchini in your garden! 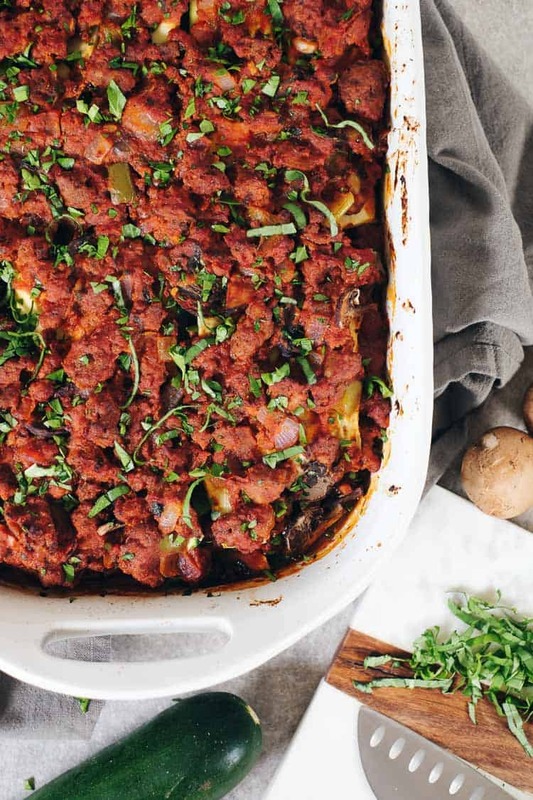 Skip the bloat and enjoy this real food lasagna recipe! Heat a large, deep skillet over medium heat. Once hot add in beef and Italian sausage. Break into small bits and cook, stirring occasionally, until browned, about 10-12 minutes. While the meat is cooking, chop up onion, bell pepper, garlic, basil, parsley and oregano. When the meat is browned, add in the onion, bell pepper and garlic. Continue to sauté until onions and peppers soften, about 5-6 minutes. Stir in tomato paste and marinara sauce and add in basil, parsley and oregano. Taste sauce and season with any additional salt and pepper as desired. Bring sauce to a quick boil and then remove from heat. Preheat oven to 350 degrees Fahrenheit and grease a 9" x 13" baking dish with butter or ghee. Cut up zucchini and mushrooms as noted. Place a thin layer (1/2 inch) of the sauce in the baking dish. Layer zucchini and mushrooms over sauce, and repeat, alternating the layering of sauce, zucchini and mushrooms. Remove, cut into pieces and serve.